A Chinese insurer, Anbang Insurance Group, was little-known before it acquired New York’s iconic Waldorf Astoria for $1.95 billion in 2015—the largest acquisition of a U.S. real estate asset by a Chinese buyer. And the company has continued its buying spree by making two new bids that aim to expand its real-estate empire in the United States. A consortium led by Anbang made a $12.8 billion bid for Starwood Hotels & Resorts Worldwide Inc. (HOT) on March 10, offering $76 a share in cash. This tops Marriott’s earlier bid of $63.74 (in cash and stock) and has a potential to derail the rival’s takeover plan. Starwood has nearly 1,300 properties in 100 countries and owns famous brands like St. Regis, W, Westin, and Sheraton. The offer implies a premium of 7.9 percent to Starwood’s closing price on March 11. 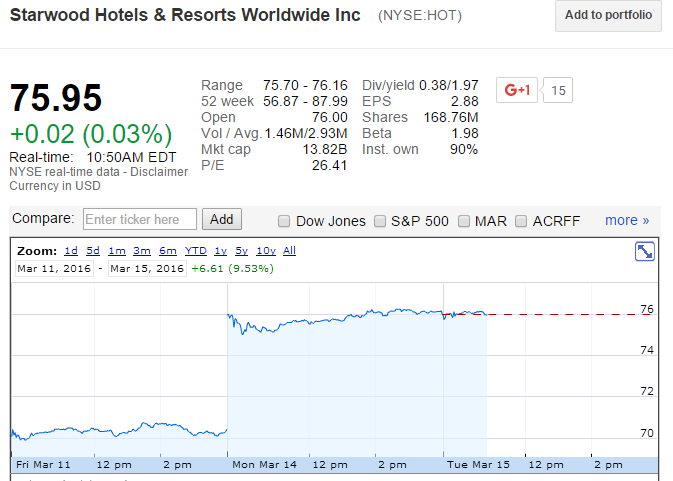 Starwood’s shares rose after the company’s press release on March 14, disclosing the details of the unsolicited bid. “Starwood has received a waiver from Marriott enabling it to engage in discussions with the Consortium in connection with its proposal,” said the company in its press release. 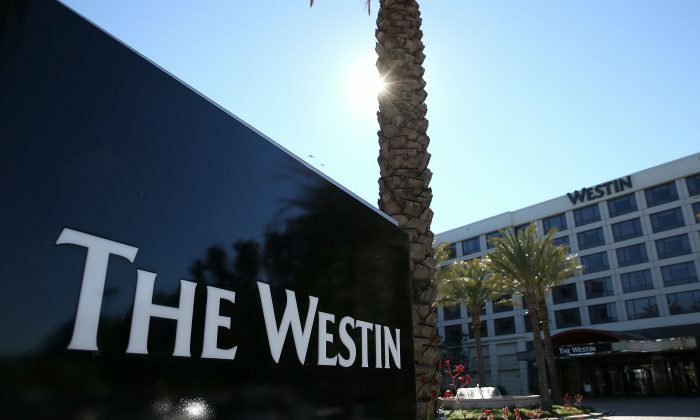 Starwood entered discussions with the consortium on March 11 and the Marriott waiver will expire on March 17, according to the press release. Both Marriott and Starwood announced on Nov. 16, 2015, that they had agreed to merge in a cash and stock deal that would value Starwood at $12.2 billion. The merger would create the world’s largest hotel company. On March 14, Marriott reaffirmed its commitment to acquire Starwood and stated: “Marriott is confident that the previously announced merger agreement is the best course for both companies.” If Starwood walks away from the Marriott deal, it has to pay a break-up fee of $400 million. “In our view, nothing changes unless a firm offer is put on the table. If that happens, we believe that Marriott may slightly improve the terms of its offer and emerge as the winning bidder,” wrote Nomura Securities analyst Harry Curtis in a note. Marriott and Starwood would be able to make more money from the combined lodging platform, according to Curtis. However, Anbang does not offer such future synergies. “Even if Anbang firms up its offer, it may need to come up with a higher price. In our view, Marriott remains the best long-term partner for Starwood shareholders,” said Curtis. Anbang has also agreed to buy Strategic Hotels & Resorts Inc. from Blackstone, a private equity group, for $6.5 billion on March 12. The deal came just three months after Blackstone purchased the U.S. luxury-resort company. Anbang’s price is about $450 million more than what Blackstone had paid in December. Anbang’s move is the latest by Chinese companies looking to invest in U.S. real estate, which is considered a safe haven. Blackstone had been planning to sell individual properties in the portfolio. But Anbang made a pre-emptive offer for the entire company, according to a Bloomberg news report. With this acquisition, Anbang will gain a substantial presence in luxury properties, including a number of Four Season resorts, San Diego’s Hotel del Coronado, and Manhattan’s JW Marriott Essex House. Anbang’s move is the latest by Chinese companies looking to invest in U.S. real estate, which is considered a safe haven. U.S. real estate is especially attractive for insurance companies that seek high investment returns as well as diversification. With the easing of restrictions over the past few years, Chinese insurers are now able to invest up to 15 percent of their total assets in offshore real estate. “These [acquisitions] are consistent with the trend we have seen in the last couple of years. It makes sense for Chinese institutions to acquire major U.S. hotel chains,” said Michael Meyer, president of F&T Group, a real estate development company, in a phone interview. Hotel chains with underlying real estate assets provide good hedging against weak Chinese economy and currency, according to Meyer. “I would expect this trend to continue at a great pace in 2016 for both hotels and other real estate classes,” he said.